The coastal waters of the south central Pacific provide some of the most fertile sport fishing grounds in the world. It is considered a world class location for those in search of blue, black and stripped marlin. As well as having a healthy population of a sail fish always make for an exciting day on the water. While all big game bill fishing is catch and release, which we as well as our partners take very seriously, there is also an abundance of large mahi mahi as well as yellow fin tuna in the area. Nothing beats a day of tagging marlin followed by catching a couple Tuna for a fresh out the sea dinner. We fish out of both the Los Suenos Marina here in the Jaco/Herradura area, as well as out of the Pez Vela marina 50 minutes south in Quepos, this allows us to be able to find a boat fitting any groups size and budget. Surf Lessons! Get up, stand up! 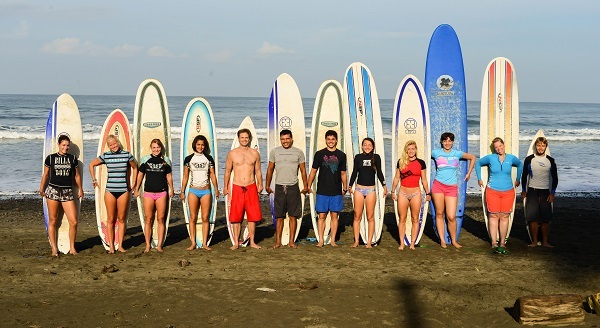 The south side of Jaco beach provides a perfect area for everyone to try their first time surfing. The way the peninsula jets out creates a natural barrier against the south southwest incoming swells that cause larger waves down the beach. We work with only the most professional, safe and passionate of surf coaches. We guarantee you will stand up your first day! Also remember the best surfer in the water is the one having the most fun! We can accommodate all ages and any size group. Heads up, party wave! There is only one way to experience the canopy which can show you its true beauty, while adding a healthy doss of adrenaline as well. Being fortunate enough to have multiple zip lines in the area, we can make sure we get you where you want to go, seeing what you would like to see. From coastal, to deep rain forest, experience views you will never forget while zipping on some lines up to 1 kilometer in length! Making sure you get to see it all! As always our first priority is safety. All of our affiliate partners now use double line systems, which are the industry leader in safety first systems. Let our guides professional bi-lingual instruction make sure you are perfectly comfortable before you set sail through the air, seeing a rare view of the beautiful lands in the area. Offering some of the most exhilarating white water rafting while delivering unforgettable views at the same time. White water rafting is a MUST if you like the water and enjoy a little adrenaline. Depending what time of year we have level 2/3, 3/4, and 4/5 rapids. All of our guides are high trained and each has years of experience. Have an absolutley exhilierating unforgettable experience that will be sure to rank among one of the best memories of your trip! Experience a once in a life time adrenaline packed descent 180 feet down a beautiful waterfall, hidden deep in the jungle surrounded by lush rain forest. 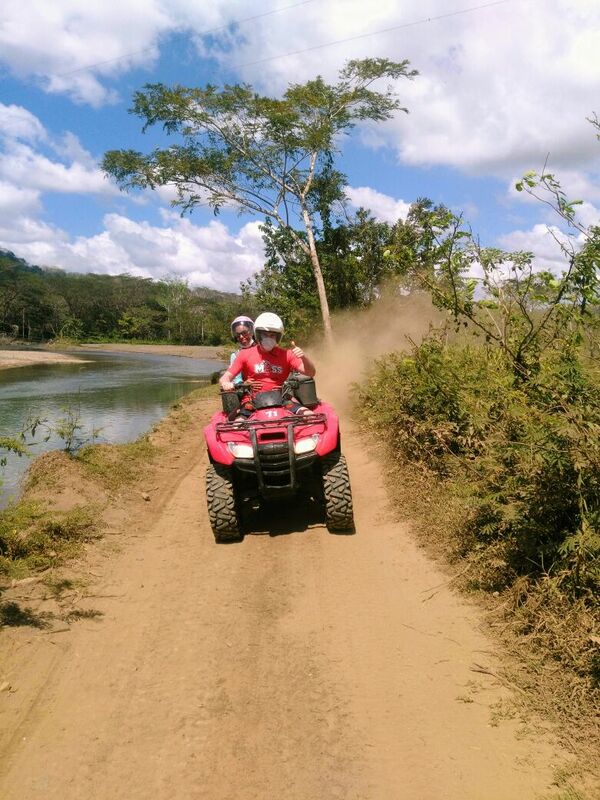 Reach the waterfalls via ATV or horseback, either way the experience will guaranteed to be a highlight of your trip. The descent while adrenaline packed is still as safe as can be. Daily checks on equipment, as well as multiple, spotters and someone belaying the climber below, prevent any accidents besides a scraped knee from time to time. You will start out by choosing your vehicle of choice. We offer dirt bikes, 250 and 300 cc ATV's, as well as four and six person side by side vehicles. All tours are private and incorporate a 4 guest per guide ratio. All guides are trained and certified first responders. Though we never anticipate this, safety is our top priority in all our adventures. Once reaching the waterfall you will be able to swim, jump and relax in a serene jungle setting. After soaking up the falls we will begin our journey back to out warehouse. On the way we will stop at a private restaurant that is second to none. With constant Toucan as well as other tropical birds often hanging around, this is a lunch you'll never forget.